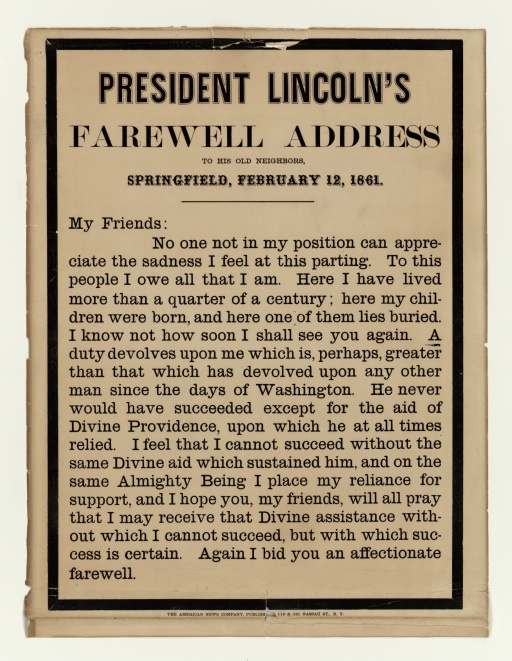 This speech was delivered to the townspeople of Springfield, Illinois on February 11, 1861 as Lincoln was embarking toward Washington DC where he would assume the presidency. I find this speech remarkable for its singular and striking humility. My friends, no one, not in my situation, can appreciate my feeling of sadness at this parting. To this place, and the kindness of these people, I owe everything. Here I have lived a quarter of a century, and have passed from a young to an old man. Here my children have been born, and one is buried. I now leave, not knowing when, or whether ever, I may return, with a task before me greater than that which rested upon Washington. Without the assistance of that Divine Being who ever attended him, I cannot succeed. With that assistance I cannot fail. Trusting in Him who can go with me, and remain with you, and be everywhere for good, let us confidently hope that all will yet be well. To His care commending you, as I hope in your prayers you will commend me, I bid you an affectionate farewell. The U.S. Presidency has often been held by men of great humility. As a country, we have consistently settled upon our two favorite presidents, George Washington and Abraham Lincoln who rise to the top in survey after survey. The singular trait that these men shared was a sincere rather than a false humility. I think it would be a terrible thing for us to lose what was once a relatively common virtue in our leaders. Like other politicians, Barack Obama has borrowed heavily from Lincoln in style. He has been very effective at copying one of Lincoln's simplest but most effective techniques, delivering his speeches at a slow cadence that allows the audience to comprehend the words being spoken. It is such a simple and effective technique that it is a wonder that it is not employed by all politicians. But speaking like Lincoln and being like Lincoln are not the same thing. You might re-read Lincoln's words above before you witness the following proclamation from Barack Obama, delivered in a June 3, 2008 speech given in Minnesota. The journey will be difficult. The road will be long. I face this challenge with profound humility, and knowledge of my own limitations. But I also face it with limitless faith in the capacity of the American people. Because if we are willing to work for it, and fight for it, and believe in it, then I am absolutely certain that generations from now, we will be able to look back and tell our children that this was the moment when we began to provide care for the sick and good jobs to the jobless; this was the moment when the rise of the oceans began to slow and our planet began to heal; this was the moment when we ended a war and secured our nation and restored our image as the last, best hope on earth. For me, those remarks betray a false humility that rankles the heart and the mind. It's a wound whose depth strikes deepest in those that know and treasure Lincoln and the original material that inspired the copy. I think it begs a historical question, of whether or not we continue to allow the modern Presidency to continue to grow in scope and power, while the very great men that held a smaller office, felt that even that limited scope was beyond them and none of them ever possessed the ability to keep from making awful mistakes. Do we really wish to put so much unchecked power at the disposal of the imperfect people that have and will continue to inhabit the office? The potential to do great harm, even while attempting to do great good, has never been higher than it is today. Enjoy American Literature's American History collection of presidential speeches, essays, and declarations.